Despite my lack of design knowledge and experience, blogging has inspired me to get out of the "I'm just a stay-at-home mom" rut and put some effort into feathering my nest. The room I'm sharing today belongs to my older daughter, Natalie, who is three and a half now. 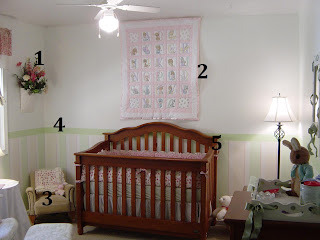 Some of these photos are older, so please don't think I make my preschooler sleep in a crib! Her room might not impress a real designer, but my husband and I put a lot of effort into it, and it was definitely a DIY project. 1. Southern Living at Home wall bucket with faux flowers. I probably paid $20 or so for the bucket, and a friend's mom did the arrangement for me. 3. Upholstered child-size rocker. Free. It was mine when I was little, and my mother's before that. I remember reading storybooks in it as a small child. 5 b. Bedding. Waverly pattern from Babies 'R Us. Being a first-time mom and having nothing better to spend my money on, I wanted everything and the kitchen sink. This pattern didn't come with a kitchen sink, but I did get the bumper, 3 sheet sets, a quilt, and a blanket. $200 for the set. The window has been replaced since this photo was taken, but this area is pretty much the same these days. 6. Bunny print. $6 at local craft fair. 7. Bought fabric for the roman shade, and a friend did the shade for me. The valance is Waverly. $30 for fabric, $20 for the valance. 8. Glider rocker and matching ottoman. Free. My mom had it sitting in her house. It was pretty beat up and needed new cushions. T spray painted it with a fresh coat of white, and repaired one of the arms. I used the same Waverly fabric and the same friend sewed slip covers and recovered the ottoman for me. I spent many long hours feeding Natalie in that rocker! 9. Three legged round table. $2 at a yard sale. Bought the white cover at Target for $10 or so, and used remnant Waverly fabric as a "runner." Both of the lamps in the room came from Wal-Mart. Approximately $40 for both. 10. The dresser was an awful brown wood laminate from my college days. To read how I transformed it into a girlie fleur de lis creation, click here. This project only cost me a few dollars for new knobs because I used leftover paint from the walls. 12. Bookshelf from mother-in-law's garage. Free. Was very dirty and dark stained wood. I used leftover wall paint to transform this one too. Natalie ended up loving Beatrix Potter, and she wore the ruby slippers as Dorothy last Halloween. The changing table was around $300. We use it as a dresser now. This hanger set is Southern Living at Home. Probably paid $20 to $30 for it. My grandmother gave me the baby clothes. They were my mother's, and the little booties were mine. The magnetic board on the other end of the dresser was a Michaels find for $10. I love the glass knobs. The purse was mine when I was a little girl, and the pointe shoes were also mine. My sister gave Natalie the beautiful German dress that she got on a trip several years ago. It was too pretty to leave in a closet. I love the Southern Living at Home tray on the dresser. It matches Natalie's mirror, and we use it to hold all her girlie stuff. Approximately $35 for both. I found this little bowl stashed away somewhere, and we use it for her little clips. 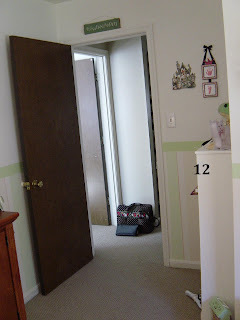 To see how I made the bow holder hanging on the wall by the door, click here. Out of all the rooms in the house (besides the "New Room"), I've spent the most time decorating this one. I feel so bad for poor Michaela Byrd...by the time she came, I was just too tired to do anything! In my defense, being pregnant with an active almost-two year old in the house was draining. It actually worked out well though. I'm not planning on making it "big girl" right now because she and her little sister will be sharing the larger bedroom soon, and I didn't want to make any costly changes. As soon as Michaela Byrd is old enough to sleep in a big girl bed, both girls will be in her room, which will be a blank slate for decorating. Lucky for me, my old day bed and guest room bedding will fit in well in Natalie's current room. Also, don't forget to mark your calendars for the next Decorating Dilemmas Party here at Serenity Now!! Read about the last party here! Hope to see you there! 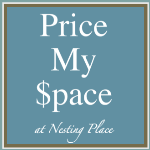 Today is DIY day at Kimba's A Soft Place to Land, and Price My Space day over at The Nester's amazing Nesting Place blog. Please also be sure to scroll down for an invite to my next Decorating Dilemmas party! I was hoping to do two separate posts today, but it's been one of those days. The kind of day where at the end of it, you just want to sit and, well, read your way through a blog party. I love a good party, so how could I resist joining in the fun again? It was nerve wracking for me the first time to link up my dinky little rooms alongside rooms of bloggers who use fancy design words like "chaise" and "polyurethane" and "bed-in-a-bag." What a big transformation! It's such a sweet space now - love it! What a wonderful job painting the wall treatment and the closest...it looks so organized AND attractive. I can't say that about my girl's closet...(it's on the to do list!). What an adorable room! I love it! It's so beautiful Amanda! Can I come over for a slumber party? I want to sleep in a room that pretty! 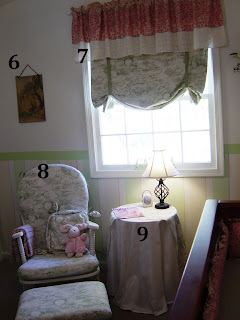 OK...that room has just made me want a baby....love it! Amanda, wow a darling room! I especially love the striping on the walls, great job! 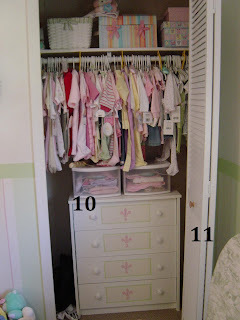 Your little girl must love her room. The stripes look great and I love all the pink. The dresser transformation is amazing. I'll have to try that on some of my cheapo dressers. Thanks for stopping by my site. I'm having a clipboard giveaway, so come back by and leave a comment for a chance to win. You have transformed the room just like magic. Beautifully done. Simply lovely! I'm sure they LOVE spending time in there!! I have always loved that crib...and you did really good on those stripes! ah, I think it turned out very sweet. You obviously put a lot of thought and effort into making your daughter a very special space. I love those antique clothes-so precious. Sorry I haven't gotten over for a decorating dilemma yet-will try to work on having a dilemma. I will add your button to my side bar and hope you'll do the same. Love that striped paint treatment! Nurseries are such fun to decorate! Aw Amanda! This is such a darling sweet room. I love it! Such a SWEET room. I just LOVE that German dress!!!!!!!!!! Found you through the Nester. I love the room and I especially love seeing the pointe shoes. I have several pairs from my years as a dancer that I'm keeping to use for just this purpose - assuming I have a girl someday. :) Thanks for sharing! i LOVE your shelf! we just put up a similar one in my daughter's room! Your nursery is so so sweet and peaceful! I LOVE the German castle and outfit hanging. Amanda you've got great taste, love the stripes and it looks so cozy. I noticed you still haven't came up with a name for your new room yet?!? How adorable is that stripped wall. You did a great job! !